Hi Forg, I have a total of six 240's, two genuine 240 GpA Works car's, one ex the Australian Volvo Dealer Team and the other is the only surviving Eggenberger Team car. I have three road cars, one hot rodded with a turbocharged 2.7 litre 16 valve engine, making 525 BHP and a one owner 1983 240DL European car done 60,000 miles, plus my 1983 Red Evo Car. My sixth car is the 1983 DL bare chassis that I will build up into a replica of my first ever GpA race car, ex GTM Belgium, that we won the Wellington Street race with in 1985. My sixth car is the 1983 DL bare chassis that I will build top into a replica of my first ever GpA race car, ex GTM Belgium, that we one the Wellington Street race with in 1985. That's the question: how replic-ikie you planning to make it? And, planning on playing with it? It will be the "Full Monty" when its finished John, I have a lot of genuine GpA spare part's, engines, Getrag gearbox's, etc, so it might take a while but I am in no hurry. I plan to race the car in Historic events here in NZ, as a replica car. I mean Group A was huge here in Oz, at least in the memory of someone who was 15 at the time, and the whole reason I’ve bothered to put ‘82 bumpers & front-clip & dash on my +T’d 242GT is due to people such as yourself & John Bowe & Robbie Francevic. Despite there still being a pretty strong anti-Volvo sentiment among people of my age in Oz, there’s still positivity towards my car when people who remember Group A see it & remember from Way Back When. But I’d kinda/sorta expect that real Group A Volvo stuff might be kinda/sorta semi-affordable, whereas verifiable Sierra Cosworth or M3 or Godzilla stuff would be way beyond the means of your average enthusiast? Or is my impression due to the aforementioned general anti-Volvo sentiment in Oz? The 'bones' of a 240T GpA replica, are incredibly cheap compared with any other front running GpA car of that era. 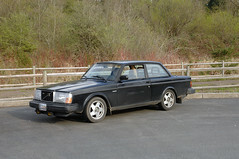 As an example of that fact, I recently purchased a one owner, rust free, 1983 240 DL car in Sweden, that is 100% the same body shell, and outer panels including front and rear bumpers as the Factory GpA cars used, for just $7K. The most expensive parts are the bolt on parts, like centre lock front and rear hubs, and the genuine period Magnesium BBS wheels, and of course the Brake system. The engines are also cheap and readily available. The most expensive component is a genuine GpA Getrag close ratio gearbox, which are hard to find and worth about A$15K in good condition. Other than the gearbox all the components have been re-manufactured from the same original VMS drawing's, so these days you can buy every thing you need brand new from within the Swedish "Brick" fraternity. I supply the genuine new GpA BBS wheels, to the fraternity and also the rear centre lock hub and axle. 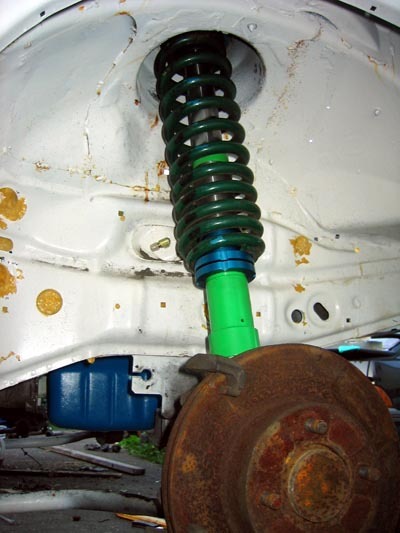 The cost to build a 100% faithful replica GpA Volvo 240T race car is about US50K plus labour, and painting etc. To many this will seem expensive but it's less than half what it would cost to build a RS500 replica, so its all relative. There were only ever about 12 so called "Factory" cars ever built, because the 240 GpA car only survived 3 years, with factory assistance, 1984/85/86. No new GpA factory cars were ever built after 1986, all though some privateers ran on in the Nordic series through to the end of 1989 and that was the finish of the 240's on the race track. However, they still live on in Tarmac rallies, dozens of them, and many producing 400 plus BHP these days, so they are quite quick and still very popular in Scandinavia. Last edited by MarkPetch; 12-25-2017 at 01:53 PM..
That 242 is a beauty. I didn't realize it was you that got it when it went up for sale. Patrick plays poker with his cards held close to his chest. Thread stickied to the top. Thanks for visiting. I hope you "stick" around. It should be interesting. Liking the history and insight from someone who was in the thick of it at the time. This is one of the best threads ever! Barton because it was near impossible to get any footage in the US of all that great racing down under. I have a 1/43 model of the number 2 Eggenberger car. Looking forward to seeing how your buildup goes. Awesome thread Mark, and welcome to the board! Why would Volvo go to the trouble of removing the Evolution goodies after the inspection? My best guess is that they were not approved for sale by the relevant agency (EPA, etc). Though the intercooler made it through. ^Considering the items were in the trunks of the cars, it would be quite easy to just take the items out and send them back. And, in Volvo's mind, it would've made sense, since they'd have 500 sets of Group A items to keep in inventory when/if a car got damaged or needed spare parts. Since the intercoolers were already installed and weren't the Group A version (instead being the style used on the 1983 760 Turbo in Europe), it would've been less messy to leave them in place, than to drain the cooling systems of all 500 cars, remove the intercoolers, install the non-intercooled (and non-turbo) radiator hoses, etc, and install the non-intercooled oil cooler brackets, bracketry for the turbo "hat" on the throttle body, the plumbing, and non-intercooled overboost switch. Goran, readily admits that the Evolution T3B Turbo, as used by the GpA cars, had way to much turbo lag to be sold for road use, an further more, as the majority of the 500 Evolution cars were fitted with Automatic transmissions, The ECU's at that point in time could not deal with the turbo lag and in his word's were basically dangerous to drive. The American importers were adamant that they would only except the car if they put back to standard, except for the Intercooler, which as one poster has already mentioned was the standard intercooler found in the European 1983 760 Turbo, and not the GpA custom aluminium and expensive, German Längerer & Reich intercooler. The importers were equally adamant that in their view the rear wing was just plain ugly and would only be offered as a dealer fitted option, they were thus left in the trunks of the car and most ended up gathering dust in dealers spare parts departments. It seem that the American buyer also though the rear wing was ugly as very few were ever fitted as far as I can ascertain anyway. Last edited by MarkPetch; 12-25-2017 at 01:57 PM.. I can help out with a few of my favorite pics Mark has shared with me. Stripped and ready to go to acid dipping. Just out of the acid bath. 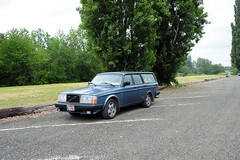 I have not been able to work out how to post pictures on this forum, otherwise I would post some pic's of my various Volvo 240's. Original 1983 242TI "Evo" "Flatnose" "Flathood" "Homologation" or whatever we are calling them these days. Interesting note: This is the same car Forza digitally scanned for the game. It's VIN tag with the "SO2476". Last edited by Tuff240; 12-25-2017 at 03:41 PM..
[QUOTE=Tuff240;5724135]I can help out with a few of my favorite pics Mark has shared with me. Thanks very much for your help Tuff240, can you email, or message me and let me know what I have to do to be able to post photo's on this site. I have Dropbox but can't figure out how to post the actual photo rather than just a link to it. Couple more pics of the AVDT 8601 car - I took these at VROM 2015 in Goteborg. Which started life as a 242GT in Australia (market code 46). Found some pictures of Finnish GrA dealer team. They had three car team, and Leif Wiik was racing with Australian imported 242. One of those three cars hit guard rail at Ahvenisto race track and I heard it was final blow. It was converted to rallycross so many special parts was long gone. Great pictures and information, thanks very much. The RHD car Leif is driving "Union" 240, is the RHD car built in Australia, by the AVDT, Australian Volvo Dealer Team, in July/August of 1986, and known as Car#44, which now belongs to me. This was the last factory "Work"s car ever built, as Volvo pulled the plug on its official involvement in GpA, after loosing the 1986 ETC because of cheating allegations, following the disqualification of the RAS team's two car with Fuel irregularities. The two RAS team cars, were subsequently crushed, after being stripped of all the good bits, so that no evidence was left of any Chassis irregularity was left. As these two RAS Team car were ex Eggenberger car's, one of which was the 1985 Championship winning car, this was an unmitigated disaster! Today that Championship winning car driven by Gianfranco Brancatelli and Thomas Lindstrom would be worth at least US$500,000 in Europe. Of the 3 Team Eggenberger cars, only the T-Car survived, which I have recently restored [almost] and is now in New Zealand. Only one of the 3 AVDT was LHD, which was my original 1984 Factory car, ex GTM-Belgium. There only appears to be one RHD car in this collect of photo's [Car#44] so we know it can't be that car that crashed and was converted to Rally-Cross because it was sold as a GpA car to a Danish Team in 1989. My LHD, car, ex AVDT, ended up in a collectors hands in Switzerland before being purchased by the late Peter Kroeber, who totally rebuilt the car like new, and still belong to his Family in Germany. So the crashed car can not have been one of the three AVDT cars, so it would be interesting to know the heritage of the LHD that crashed? Its a shame that I still have not figured out how to post pictures yet, but when I get it figured it out I will do so. Car#44 by the way is in the picture's already posted on this thread, by Tuff. Last edited by John V, outside agitator; 12-26-2017 at 04:33 PM.. Thanks John V, I will get my grandson to try agin tomorrow morning NZ time. No problem....my youngest girl--about 10 1/2 is my IT Consultant...she's good!